RED LAYER: Open the red plastic freezer pop sleeve and pour the red liquid into a small prep bowl. 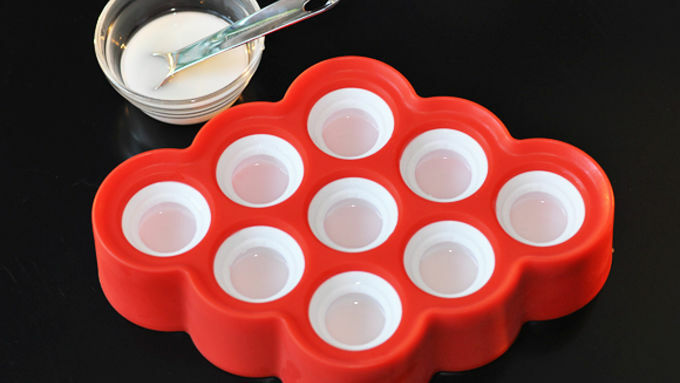 Add 1-1/2 teaspoons to each Zoku™ mini pop mold. Place mold tray into freezer and freeze the red layer for 90 minutes, or until frozen solid. WHITE LAYER: When red layer is frozen, combine the water and sweetened condensed milk in a small prep bowl to make the white layer. Put 1-1/2 teaspoons of white liquid over the frozen red layer in the molds. Freeze for 90 minutes or until frozen solid. After white layer is frozen solid, remove tray from freezer. Using the tip of a very sharp knife, gently turn the knife tip into the center of each mold to bore a small hole THROUGH THE WHITE LAYER ONLY. (Note: Do not go through the red layer, or you may puncture the soft mold and ruin it!) The hole is to allow the pop handle to be placed flush in the molds after the blue layer is added. 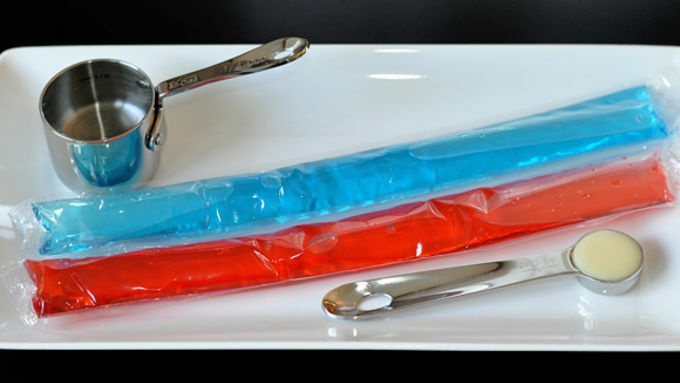 BLUE LAYER: Open the blue plastic freezer pop sleeve and pour the blue liquid into a small prep bowl. Add 1-1/2 to 2 teaspoons of blue liquid over the frozen white layer, filling up to the fill line on each mold. Immediately place a handle over the top and gently press to secure. Freeze pops 2 hours or overnight. Press each mold from the bottom with one hand while gently pulling on the handle with the other hand. The molds will easily invert and release the pops. Place mini pops upright in an ice-filled bowl or platter. Can also use glass vase pebbles to stand mini pops upright in a decorative container. Keep frozen until ready to serve. 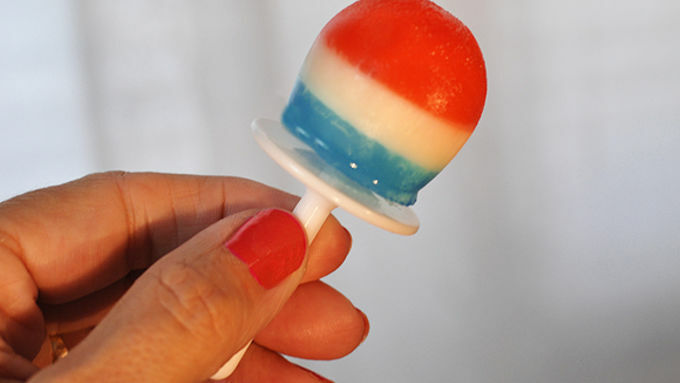 These Zoku™ mini pops take a cue from Uncle Sam and pop up dressed in their red, white and blue-striped best! These li'l pops made in Zoku™ Mini Pop Molds are like Bomb Pops meet candy-pacifier rings. Your 4th of July guests are gonna do cartwheels right into the lake when they see 'em! They couldn't be easier either. With the Zoku Mini Pop Molds and some store-bought slurpy stuff, prep is a piece of cake. 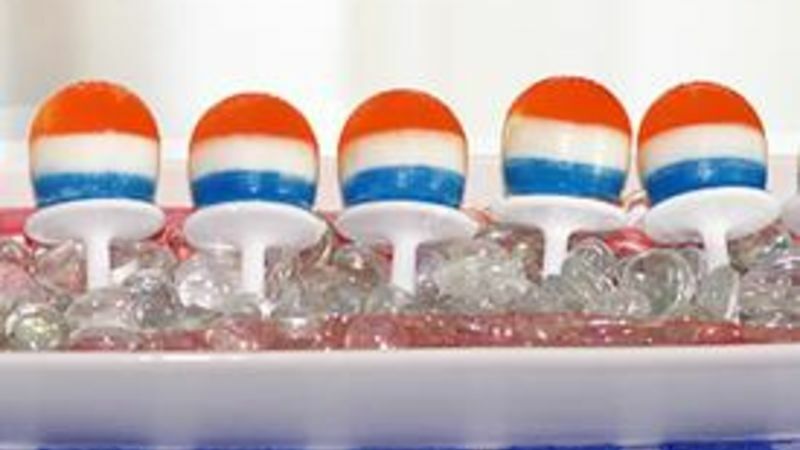 Just freeze 'em up, one layer at a time, and pop 'em out when your patriots need to chill out. Ingredients? Not so much. This is all: 1 red and 1 blue freezer pop (unfrozen), some water and a tad of sweetened condensed milk. Releasing these cuties from the Zoku Mini Pop Mold is a snap! Push up from the bottom with one hand as you gently pull on the handle with your other hand. Seriously -- fwooop -- out they come, soooo easy. Adorbs! This was my test one but I couldn't resist giving it a lick. Reminds me so much of summertime as a kid! Line 'em up and pass 'em out. These are a perf palate cleanser after a BBQ dinner and before the big fireworks show.